My post title is from a 1960 movie made from a novel by Rosamond Marshall. The movie/novel wasn’t about cannibalism, however. 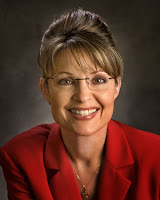 Sarah Palin wrote a post last week using the subject of cannibalism but her topic wasn’t fiction. No, far from it. We have had, over the last year, many examples of political cannibalism and they weren’t and aren’t being practiced by the democrats. No, the current cannibalism is a fight between the ‘Pub establishment and the rising forces of conservatism and the Tea Party. I spoke up before the South Carolina primary to urge voters there to keep this primary going because I have great concern about the GOP establishment trying to anoint a candidate without the blessing of the grassroots and all the needed energy and resources we as commonsense constitutional conservatives could bring to the general election in order to defeat President Obama. Now, I respect Governor Romney and his success. But there are serious concerns about his record and whether as a politician he consistently applied conservative principles and how this impacts the agenda moving forward. The questions need answers now. That is why this primary should not be rushed to an end. We need to vet this. Pundits in the Beltway are gleefully proclaiming that this primary race is over after Florida, despite 46 states still not having chimed in. Her column contains much more than the excerpts I’ve shown above. Her last sentence really asks the real question, “So, one must ask, who are they really running against?” The sad truth is that the ‘Pub establishment is running against us. — Sarah Palin, FOXNews, January 29, 2012 at 11:22 am – Fox News via tv.Breitbart .com. The ‘Pub establishment is scared silly Newt may get the nomination. They’ve created a “big lie” that he didn’t respect Ronald Reagan and insulted “the Gipper” numerous times. Supposed proof was a speech by Newt in the 1990s, used by the establishment, as their proof. However, when the actual recording of that speech is examined, the supposed comments by Newt were absent. Those statements were manufactured lies. The ‘Pub establishment even resurrected Robert Dole and Elliot Abrams to spread the Big Lie. Romney and the ‘Pub establishment had better take care not to poison the well. Tactics such as these could drive voters away. Already I’ve heard some saying that if Romney is the candidate come November, they’ll leave that vote blank. We cannot afford to split our conservative base. The true misfortune is that the party establishment in DC is not conservative. Perhaps it is time to create a new party. One that listens to us instead of an establishment dictating what we want…like the democrats. No post. Didn’t find a topic that drew my fancy today. I started yesterday with a short to-do list. Got one outa three. A 33% success rate isn’t good. Today, I start with the same to-do list and strive to finish with a better than 33% success rate. The state media and the ‘Pub establishment have started another dog-pile on Newt Gingrich. Both want a milquetoast President that can be controlled by the Ruling Class. As much as they try, they still don’t understand the people of this country. What is needed in the White House is a conservative Pit Bull, not some wishy-washy, moderate Yap dog. A Yap dog is a cross between a small lap dog and a smaller ankle biter. A Yap dog barks like a big dog but runs and hides at the first sign of opposition. Today will be busy. I have a bunch of errands to do—look for a new office chair, get a haircut, write a blog post. Of the three, the last item is the last item in the to-do list. Maybe if I can keep it short, I can do it first and then on to the rest of the list. The ‘Pub establishment had Indiana Governor Mitch Daniels present the rebuttal to Obama’s State of the Union campaign speech last night. This morning, all the pundits were ga-ga over Daniels, gushing about how great he did last night. My observation? It was the Bland following the bland. Obama was bland because it was the same old crap. More taxes. More spending. It’s the ‘Pubs fault. The do-nothing Congress (while ignoring the 30+ bills sitting in Harry Reid’s waste basket. Bills passed by the House and stone-walled by the dem controlled Senate.) I could have snoozed through Daniel’s speech and not missed anything. He, another milk-toast, non-aggressive, moderate, seems appropriate as the poster-boy for the ‘Pub establishment. Then the ‘Pub establishment had Mitt Romney, another milk-toast, non-aggressive, moderate, give the “pre-buttal” speech. Notice how the ‘Pub establishment is in a rut? 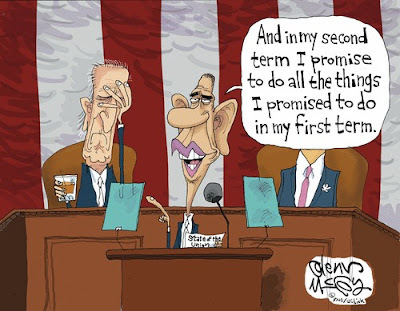 The ‘Pub establishment doesn’t believe they can beat Obama. The rest of the country believes anyone can beat Obama. The failure to connect with their base is why the ‘Pub establishment will lose, one way or another. Some items caught my eye this morning. While everyone has been watching the ‘Pub debates, the left has been preparing their attacks too. I saw these item on the ‘net. Occupy Wall Street “is an inchoate, leaderless manifestation of protest,” but it will grow. It has “put on the agenda issues that the institutional left has failed to put on the agenda for a quarter of a century.” He reaches for analysis, produced by the political blog ThinkProgress.org, that shows how the Occupy movement has pushed issues of unemployment up the agenda of major news organizations, including MSNBC, CNN, and Fox News. It reveals that in one week in July of last year the word “debt” was mentioned more than 7,000 times on major U.S. TV news networks. By October, mentions of the word “debt” had dropped to 398 over the course of a week, while “occupy” was mentioned 1,278 times, “Wall Street” 2,378 times, and “jobs” 2,738 times. You can’t keep a financier away from his metrics. The article is a standard fluff-piece that attempts to show the greatness of George Soros. It conveniently leaves out the fact that the “Occupy New York” movement was funded by Soros. Given that, the statement by Soros above isn’t a prediction of possible events. No, it is nothing more than a threat to the nation by one of Obama’s cronies. In another planned attack by the left comes this from Indianapolis. Indiana unions, opposed to becoming the first right-to-work state in the Rust Belt, may disrupt Super Bowl XLVI in Indianapolis. Their unnecessary roughness will cost the Hoosiers needed jobs. I’m sure that disrupting the Super Bowl will endear the unions in the hearts of all the football fans around the globe. In this third case, public service unions have entered the GOP candidate selection process. They’re broadcasting anti-Romney ads. The piling-on of a liberal group on top of the Republican organizations attacking Mr. Romney highlights an irony to the 2010 Supreme Court decision that injected massive independent expenditures into politics with a ruling cheered by many conservatives: The majority of the spending thus far has been used to demonize Republicans. Now, in addition to the Republican ads comes the union’s buy, by far the largest from a Democratic-leaning group. AFSCME did not return a call for comment. The large-scale, full-frontal meddling in an opposing party’s primary is rare. The most recent prominent example may be the expenditure that triggered a series of court rulings dramatically expanding the ability of outside groups including corporations to spend on politics: In the Supreme Court case bearing its name, the conservative group Citizens United sought to air a biting, lengthy attack on Hillary Rodham Clinton in the days before she appeared on ballots as a Democratic presidential candidate facing off against Mr. Obama. Although that film was fueled by genuine opposition to Mrs. Clinton, the AFSCME ad could be an attempt by a liberal group to push Republicans further to the right as part of a forward-thinking strategy. I suppose if the dems can’t get enough line-crossers to affect the ‘Pub selection process, they’ll try to poison the well. Typical, I suppose. The left and the ‘Pub establishment of Bill Krystol, Charles Krauthammer, Karl Rove, Brit Hume and Ann Coulter, still don’t understand why Newt has risen in the polls and his appeal to the country—conservatives, evangelicals, and the Tea Party. The answer is simple but the establishment will never understand. The time for leadership by wimps has passed. What we need to turn this country around, to re-establish our relations with our allies, to preserve our national security and our borders, is a leader. An aggressive leader with a vision who understands the complexity of the world as it is—not as the establishment wants it to be. Thomas Sowell wrote the article below in the Investor’s Business Daily. The left understands, the ‘Pub establishment doesn’t. Just days before the South Carolina primary, polls showed Mitt Romney leading Newt Gingrich. Then came the debates and the question about Gingrich’s private life, which brought a devastating response from the former speaker of the House — and a standing ovation from the audience. 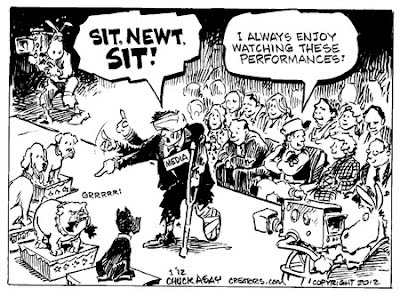 Apparently the television audience felt the same way, judging by the huge turnaround in the support for Gingrich. The stunning victory in South Carolina brought Newt’s candidacy back to life. But the message from South Carolina was about more than a reaction to how Gingrich dealt with a cheap-shot question from the media. Nor was it simply the Republican voters’ response to Newt’s mastery as a debater. The more fundamental message is that the Republican primary voters do not want Mitt Romney, even if the Republican establishment does — and it is just a question of which particular conservative alternative voters prefer. The successive boomlets for Michele Bachmann, Rick Perry and Herman Cain showed the Republican voter’s constant search for somebody — anybody — as an alternative to Romney. The splintering of the conservative vote among numerous conservative candidates allowed Romney to be the “front-runner,” but he never ran far enough in front to get a majority. Mitt Romney’s supposed “electability” — his acceptability to moderates and independents — has been his biggest selling point. Moreover, he is just the kind of candidate that the Republican establishment has preferred for years: a nice, bland moderate who offends nobody. This is the kind of candidate that is supposed to be the key to victory, no matter how many such candidates have gone down to defeat. If the bland and inoffensive moderate was in fact the key to victory, Dewey would have won a landslide victory over Truman in 1948, and John McCain would have beaten Barack Obama in 2008. Whomever the Republicans choose as their candidate is going to have to run against both Barack Obama and the pro-Obama media. Newt Gingrich has shown that he can do that. Romney? Not so much. There is much more to the article on IBD. Go there and read it in its entirety. You’ll receive an education. So would you, Ann, Bill, Brit, Charles and Karl.